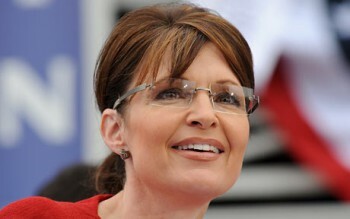 Sarah Palin will deliver the keynote speech at Right Online this month. Left-wing internet website Politico announced this afternoon that Sarah Palin will headline Right Online this month in Las Vegas. The annual conservative convention will also include an extended preview of the movie Hating Breitbart that is scheduled for release later this year. The conservative blogosphere has yet to move past the death of patron saint Andrew Breitbart, but it will get a major jolt this month from an equally provocative hero: Sarah Palin. The former Alaska governor and 2008 GOP vice presidential nominee has committed to delivering the keynote address at Right Online, the annual gathering of conservative bloggers and online activists organized by the Koch-backed non-profit group Americans for Prosperity Foundation. The June 15-16 conference will be the first time the event is held on a different weekend and in a different city from the liberal online activism conference upon which it was based, Netroots Nation. And that’s no mere coincidence, say Right Online organizers. This year’s meeting is focused on higher-level tactics and strategies than past year’s editions of Right Online, which sometimes had the feel of a crash course on blogging 101. The Vegas conference features training on video exposes to be conducted by guerrilla video journalist James O’Keefe, a session on polling featuring conservative’s favorite pollster Scott Rasmussen and a session moderated by columnist Michelle Malkin entitled “How to Use Facebook & Twitter to Win,” which will include instruction on using social media to drive narratives. It’s an area in which Palin can rightly be considered a pioneer, having mastered a high-impact, communication style that almost completely circumvents a traditional media from which she’s sometimes gotten rough treatment.